The Apartamentos Buenavista is a 3-star accommodation that offers fabulous One Bedroom Apartments in the heart of Benidorm. You won’t be far away from the lively nightlife, sandy beaches or tourist attractions during your stay at this self-catering property. The apartment complex has three swimming pools (one indoor with hot tub to soak in and two outdoor), while there is a snack bar that offers both drinks and selection of light meals during the day. The apartments are also close by to several golf courses in the area, excellent for those wanting to practise their swing in their spare time. Each of the apartments have fully-equipped kitchens, balconies and air conditioning and whether it’s a family holiday, couples or groups of friends, the Apartamentos Buenavista has a welcoming atmosphere with easy access to all the tourist spots in Benidorm. 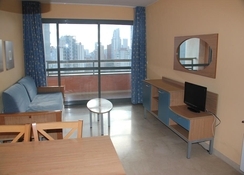 The Apartamentos Buenavista are in a good spot from which you can explore the main sights in the tourist town. This includes the Aqualandia Water Park (600 yards), Terra Mitica Theme Park (3.2 miles), Las Rejas Golf Course (3.4 miles), Villaitana Golf Course (4 miles) and the Plaza Mayor Square (1.8 miles). The Alicante International Airport is 30 miles away from the property. The apartment complex comprises of One Bedroom apartments that can sleep up to four people. They all have a living area, furnished balcony, satellite TV and air conditioning in the summer months. The fully-equipped kitchens mean that you can prepare your own meals as well while all the apartments have a modern finish to them with everything you need to have a comfortable stay here. 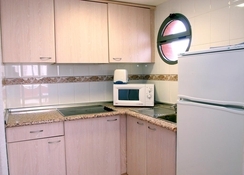 These apartments are self-catering, so guests can cook at their leisure in the apartments. 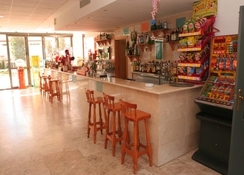 There is also a snack bar avialable at the Apartamentos Buenavista that provides breakfast, drinks and a selection of light meals. The nearest supermarket if you need to stock up on groceries is just over 500 yards away from the complex. It’s close location to the centre of Benidorm means that you are only a short walk from many bars, restaurants and cafes. The Apartamentos Buenavista has three swimming pools on-site, one of which is inside and also features a hot tub. The sun loungers around the pools mean that you can soak up the sun and the nearest beach is Playa de Levante, which is just under 1 mile away and has a range of watersports and different leisure activities available. The two golf courses in the area – Las Rejas and Villaitana – are also easily reachable from this location. We had a lovely week long stay here in July 2017 for our sons 18th birthday. Our flight was delayed so we arrived at the apartments at around 2.30 in the morning and despite the late hour, we were warmly welcomed by one of the staff and checked in. The rooms are slightly dated, but this did not spoil our stay. 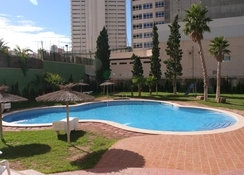 The apartments are situated in a great part of Benidorm, away from all the hustle and bustle. 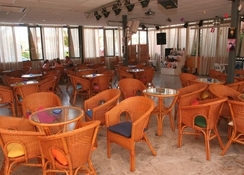 There are some good bars nearby and Benidorm palace is just 5 minutes walk down the road. Would definitely stay here again. We didn't know what to expect as this was last minute & Cheap but the apartment was all we needed, clean when we arrived towles changed once and staff were friendly. didn't use the indoors pool ir jacuzzi but the people who did seemed to be enjoying it. the beach was just a 10 minute walk away. Get what you pay for. Staff were horrendous though.